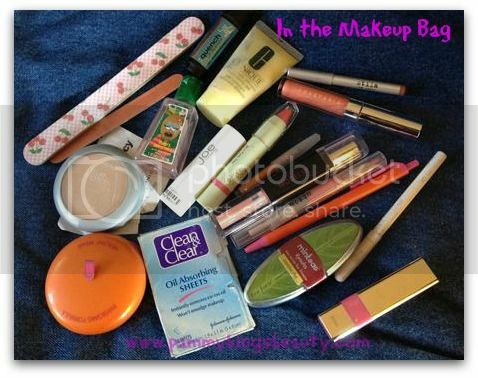 Rather than do my usual JustFab monthly review, I thought it would be fun to do an updated "Whats in my Handbag/Diaper Bag"! I am constantly trying to get organized in the handbag department. My bag functions as both a diaper bag and a purse. So, as you can imagine, I carry around a TON of stuff! I need my bag to be functional and organized while carrying everything that I need for my baby girl and myself. Ever since finding the 760 Bag by JustFab, I realized that a large handbag could easily function as a diaper bag. Plus, ya'll, using a large handbag for a diaper bag is soooooo much cuter! While I still totally love the 760 bag, it is really enormous. As my baby is transitioning to toddler hood, I am carrying around slightly fewer things. For example, I don't always need to carry around a bottle/sippy for her. So, if I do need to bring that, I bring a separate cooler bag. Eliminating that from my handbag has allowed me to downside just a bit. When I do want to carry a bit more (including a sippy and a blanket in my bag), I still reach for the 760. Before getting into my "What's In My Handbag/Diaper Bag" details, lets talk a bit more about what JustFab is all about! What is JustFab? How do I sign up? Besides the items in your personal JustFab Boutique, VIP Members also have access to shop in JustFab's Special Collections. Their special collections include The Fowler Collection as well as looks from New York Fashion Week , the edgy Iron Fist collection, featured selections from the IPSY Girls (formerly "My Glam"), the Denim Shop, Fall Bags, and rocker-chic Abbey Dawn by Avril Levine. If you missed some of my previous JustFab reviews, please check them out here: Just Fab Monthly Shoe and Accessories Subscription, Shoe Bag Love, What's In My Diaper Bag?, The Fowler Collection , and Outfit of the Day. Now, lets get into it! 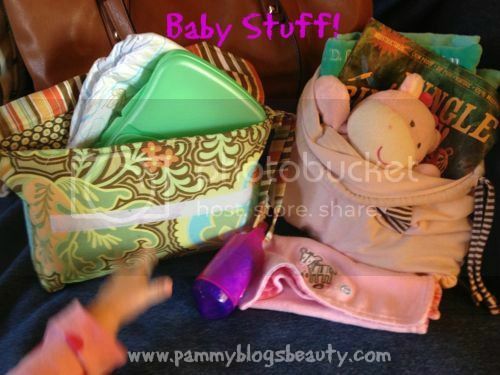 What is in my Handbag/Diaper Bag? This month I chose the beautiful camel colored Times Square bag. To find out how I like it and to see what is inside, keep reading! Don't you just love getting the chance to peek inside some else's bag? I love reading posts like these as I like to get organizational strategies ideas and I like to see what products everyone uses on a daily basis and loves! First, how about some details about the Times Square bag! This bag is just *gorgeous*!!! This is, hands-down, the most beautiful handbag that I have gotten from JustFab to date. It is incredibly soft and absolutely looks like real leather (but it is not!). I am totally in love with this bag! It looks much more expensive than it actually costs. I am just thrilled with it! 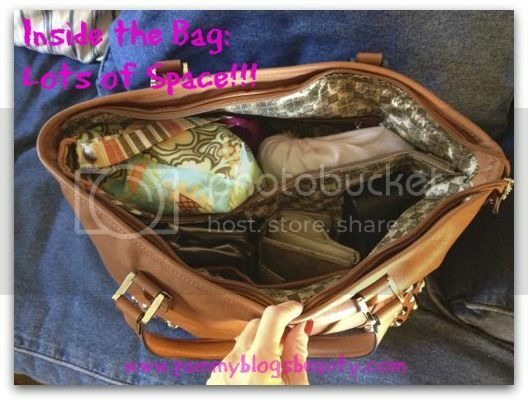 The bag is 18x12x12 which makes it the perfect size for its current function: a purse diaper bag hybrid! This size would also make it great for a workbag (or school bag) as it can easily fit my Macbook Air and iPad and could hold files too. The width of this bag is just right! I like totes that are wider than they are deep as that is how I utilize the space. Often when bags are too long, I feel like the space on top is "wasted space" (does that make sense?). While this bag is certainly large, it is not so big that it overwhelms my small frame (for reference I am 5'5 and slender). The handle drop is just right for the bag to sit comfortably on my shoulders. The bag zips completely shut (even when it is completely stuffed with my items)! Yay!!! Also, the width and depth of this bag keep it from toppling over. It sits up just right! The inside is divided in half and features one inside zipper pocket and 2 side pockets. The outside of the bag has one zipper pocket (perfect for your keys and phone). The gold stud details are just so cute! Stud embellishments are so in right now. Actually, that is one of the main reasons that I chose this bag. They add a bit of fun and fashion to this neutral bag. I love the camel shade (the shade is actually called "tan" on the JustFab site). It goes with just about everything. I just love carrying this bag! 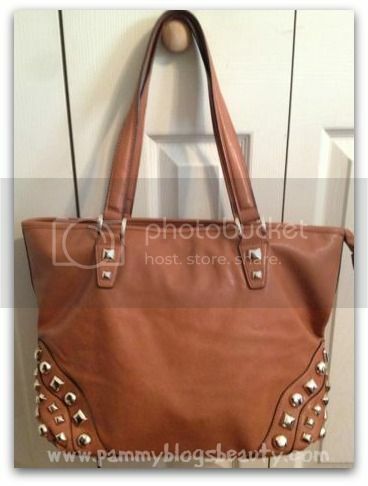 So much that I am planning on ordering this bag in another color! It also comes in Red and Black. I am thinking I will get black. I find that keeping my items inside smaller zipper bags is the best way to stay organized. I devote a "category" to each bag. So, I have a makeup bag, a lotions bag, a diaper holder bag, and a toy bag. Everything else fits inside pockets in the bag. Clean & Clear Oil Absorbing Sheets: Blot, blot, blot! The assortment always changes. I try to rotate so that I can make sure the toys hold my baby girl's interest! Currently, I have some books, a lovie blanket, and some rattles that can attach to her car seat or a high chair cover. When I am out and about, I do like to moisturize! The bag is from St. Germain a "new" brand I am trying out. I love the faux leather texture of this little zipper bag. Eucerin Daily Skin Balance Hand Cream: I LOVE this hand cream!!! It has a lovely cherry scent and it just works so well. I am almost out and need to get a refill soon! I keep another one of these on my nightstand. Great stuff! Aquaphor Advanced Therapy Skin Protectant: I am obsessed with Aquaphor. You can use it for everything: Lips, cuticles, skin irritations, and on the baby! 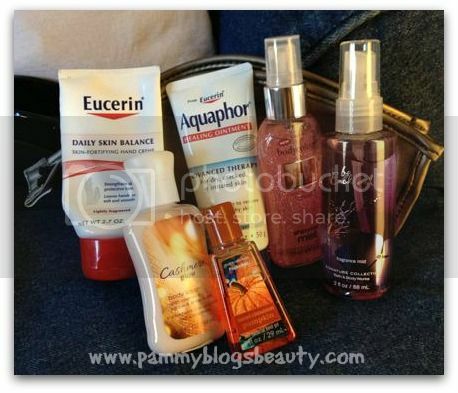 I almost always have Aquaphor in my purse (especially in the winter). Bath and Body Works Sweet Cinnamon Pumpkin Antibacterial Hand Gel: I am obsessed with this scent! This is a hand-made diaper holder that I got either on Etsy or Ebay (can't remember!). It velcros shut and has a snap handle. I attach a Munchkin trash bag holder on the handle (Mommys-to-be: these are must haves! With this little holder you always have a trash bag for your baby's dirty diapers). The inside of this diaper holder has a wipes container, a small changing pad, and 3 diapers. When I need to change the baby, I just take this out of my purse and head to the restroom. I don't need to fish around my purse for all of my diaper changing items. It is all in this holder! Gucci Wallet: I really adore this wallet! It is sooooo old (but still kickin). It is a little worse for the wear. However, I think it looks pretty great considering it is like 5+ years old. It holds a TON! Prada Sunglasses and Sunglasses Case: My sunglasses are almost always either on my face or on my head. I rarely put them in the case. However, since they are expensive sunglasses, If I do put them in my bag I want them in the case so that they don't break. Envirosax Fold Up Tote Bag: This is a little lightweight nylon tote bag that rolls up and snaps shut. It is great to have! It dosn't take up much space and weighs nothing. This way I always have a bag available if I run into the grocery store. I got this one at a beauty event. Body Sprays: I think I have a phobia of not smelling fresh! Plus, I have a bit of an obsession with Body Sprays. I have Bath and Body Work's "Be Enchanted" Fragrance Mist and Bodycology's "Enchanted Forest" (Twilight Woods dupe) Shimmer Mist. I love the Be Enchanted fragrance and the Shimmer Mist is new (So, I honestly haven't even used it yet, lol!). Side note: I have come to the realization that I should always purchase small fragrance mists! I never seem to use them up all the way and love to be able to carry them around. I find that these light mists layer nicely over whatever perfume I might be wearing. So, that is it! You got to peek inside and see what I carry around and use on a day-to-day basis! :) Plus, can you believe even with that much stuff inside the bag, you can still zip it up! The Times Square bag works amazing as a handbag/diaper bag hybrid! I highly recommend this bag!!! You might be wondering what else I got from JustFab this month? I got another pair of the Laden flats from the JustFab Fowler collection. I liked them so much in Silver (remember from last month?) that I had to get them in Black too! :) These cute flats are just perfect!